Let’s imagine it’s 2011 and I had this exact same job and my boss told me I had to blog about five good Matthew McConaughey movies. “I’m sorry,” I would politely say. “It’s not possible to find five good ones. I could find two, maybe three, but five? Not happening.” Okay, maybe I wouldn’t say it that politely. And I wouldn’t say that just because I’m a wisenheimer sarcastic person looking for something mean to say. I would also have been right. Seven years have passed since then, and while I remain a wisenheimer sarcastic person looking for something mean to say, Matthew McConaughey has actually made a bunch of good movies. McConaughey is from Texas. If he wore a large neon sign attached to his shoulders with arrows pointing at his head saying “This Guy Is From Texas,” it would be only slightly less obvious. His initial burst of stardom came from a fantastic Texas-related supporting role as a guy who can’t quite grow up after graduating from high school in small-town Texas in Dazed and Confused (1993). And then…well…we got nearly two decades of “kinda good,” “sorta good,” and “meh” Matthew McConaughey movies, followed by a sequence of genuinely awful romantic comedies during the 00s. This seems to have led to a “What the heck am I doing?” moment in his life, when he looked over his filmography and the kinds of scripts he was getting and decided it was time to start saying no. “No” to calorie-free romantic comedies like How to Lose a Guy in 10 Days (2003). Or “no” to really dopey action movies like Sahara (2005). Things sort of hit bottom with 2009’s abysmal Ghosts of Girlfriends Past. McConaughey decided it was time to start looking for interesting roles in movies that have something more going for them than just light laughs and parading around shirtless. 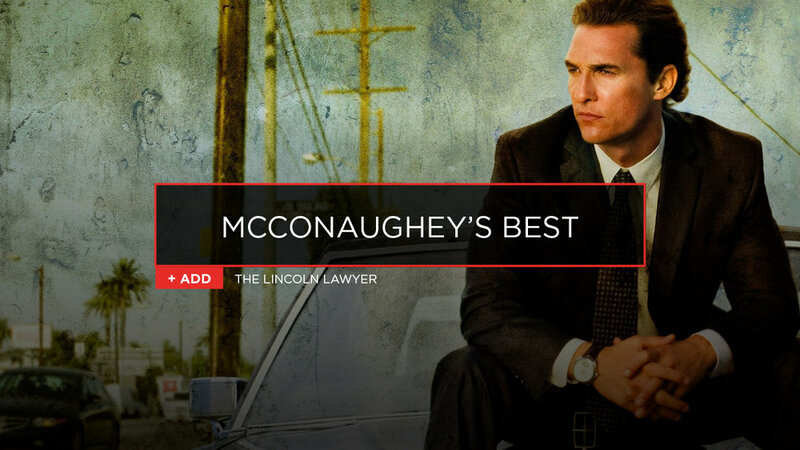 It took him almost two years, but he found it—one of my favorite Matthew McConaughey movies—The Lincoln Lawyer (2011). Based on the comic novel of the same name by Michael Connelly, in this darkly comic and heart-pounding thriller, McConaughey plays Mickey Haller, a flashy criminal defense attorney with a coterie of clients from the seamy side of Los Angeles. Haller lands a wealthy client who is accused of murder. And things are looking up for him; finally a rich client and access to that world. But it’s an ugly world, the world of the wealthy. And too many spoilers are available to me at this point, so let’s just say I’ve watched this movie three times and enjoyed it more each time. Great cast that also includes Marisa Tomei, Ryan Phillippe, Bryan Cranston, John Leguizamo, and William H. Macy. Here are the rest of my favorite Matthew McConaughey movies. All of them come highly-rated and are definite must-rents. It’s hard to believe that this movie is 25 years old now, but Richard Linklater’s love letter to 1970s high school in a small town in Texas is as fresh as the day it opened. This is American Graffiti (1973) with an edge. It’s a large ensemble cast, but McConaughey stands out as David Wooderson, the guy who graduated a couple years ago but who still hangs out with high school kids. McConaughey is just about pitch perfect in this role and manages to be the most memorable actor in a cast with 25 actors with speaking parts. This movie is relentless fun and is worth watching at least once a year. Especially if you either went to high school or lived in Texas. If you meet either of these criteria, rent it again. Two years after The Lincoln Lawyer, McConaughey starred in his best movie to date: Dallas Buyers Club (2013). Both of these films were among the top rented DVDs the years they came out. Based on a true story from the early 1980s, in Dallas Buyers Club McConaughey plays electrician and part-time rodeo cowboy Ron Woodroof, who discovers he has AIDS. Woodruff organized a “buyer’s club” to bring as-yet-unapproved-and-thus-illegal medicines into Texas for himself and other fellow AIDS patients. McConaughey is brilliant and even lost 50 pounds during filming to demonstrate the devastating physical toll AIDS takes on his character. He received the Academy Award for Best Actor for this film, and co-star Jared Leto won the Best Supporting Actor Oscar. This was only the fifth time in Academy history that both acting awards have gone to the same movie. Christopher Nolan cast McConaughey in the lead for his sci-fi epic Interstellar. You know that word you see every once in a while—dystopian? It’s one of those words you kinda think you know but never actually bother to look up. Well, I read it a lot in reviews when this movie came out and I finally figured it was time to look the word up and see what it exactly means. Ah-hah! It does mean what I thought I means! Nolan tells the tale of a band of astronauts who go through a wormhole so they can find habitable planets for humankind to live on since Earth has become a dystopian wasteland. (Okay, now it’s your turn to look up the word.) McConaughey is excellent and the cast also includes Anne Hathaway, Jessica Chastain (whom I’ve had a huge crush on for years), John Lithgow, Michael Caine, and Casey Affleck. It’s visually spectacular and heart-pounding. There were a few other movies I considered for this fifth spot on the list (Amistad (1997), Mud (2012), or even Magic Mike (2012)), but after watching both this film again and Mud for the first time yesterday, I’d have to pick this one. Gus Van Sant directs this gripping melodrama about a man who goes to the suicide forest at the base of Mt. Fuji to do himself in following his wife's (Naomi Watts') death from cancer. The marriage had been terrible, but after her diagnosis it dramatically improved… but then she died. It’s a moving and compassionate film about how we all take things for granted and then struggle to cope after they are taken from us. Now, if he could just stop making those really schlocky Lincoln ads, I would be even happier.